Sarajevo celebrated but moderately: a few car convoys Monday evening and few dozen people on Tuesday afternoon. Groups of people moved between the Cathedral and the Carsija after 6pm, celebrating the arrest with a few whistles and banners. Overall, nothing much happened. One does not celebrate the end of a nightmare, but only quietly feels the taste of it. And, Karadzic was the nightmare: the siege, the misery, the terror. Gathered in front of the TV screens in the bars, the people of Sarajevo constantly exchange text messages. They still wear tension, not joy. When the prisoner appears on the screen, somebody spits and curses. The news still has to settle. Then, the gap between Dr. Dabic to Radovan Karadzic is too great. I remember a woman from the 10 year anniversary of Srebrenica. She survived the July '95 massacre and told me she still feared them, those who were "hiding in the woods." Wolves. This is how we all imagined them: protected by armed gangs ready for everything; so strong that even NATO feared them, worried about possible casualties that an armed clash may cause. And yet, here he is. Unarmed. A harmless, vaguely absentminded old man. With the ponytail and the Saddam-like beard. How differently men look when they no longer have power. This is not Radovan Karadzic. It is a local physician who has embraced alternative medicine at the end of his career. He teaches courses and practices yoga. The most impressive photo is where he sits on a panel together with other presenters. It looks like meeting of the council of residents. What are they talking about? Of how bad antibiotics really are? I imagine how the scene goes on. An old lady takes the floor saying she has persistent headache. Dr. Dabic with a reassuring tone advises her to practice some relaxation techniques. In another life, on March 4 1992 he was roaring in the Parliament in Sarajevo of how Bosnia and Herzegovina is heading into war and the Muslims towards extinction. How strange are the ways of justice, which arrives only when the wolf has already turned into a lamb. Why only today? Only because Serbia needs to enter Europe? The survivors and relatives of victims I spoke to these days keep telling me this. There is satisfaction of course, but mixed with bitterness. As the arrest of Karadzic seems to suggest, things have really changed in Belgrade. If politicians have control over the secret services and the military now and European pressure on the new government continues, we could soon expect the arrest of Karadzic's armed right hand, Ratko Mladic. Subsequently, after the signing of the Stabilization and Association Agreement (SAA), Serbia's road toward the EU would, rightfully, be open. This is an epochal shift for the region. Finally, the Balkans could integrate and become a mirror that restores the sense of the European project. Not just an area of free exchange, but of cultural richness, rule of law, and togetherness of minorities. Peace inside and outside the European borders: that which should have happened before the rain. Sarajevo is, however, dominated by restraint, not enthusiasm. Things are perhaps changing in Serbia but not in Bosnia and Herzegovina. 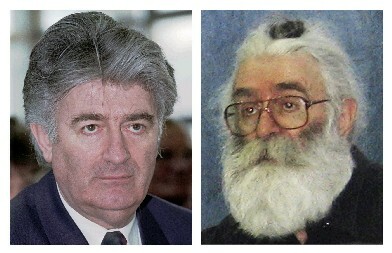 The capture of Karadzic is a symbolic closure of a chapter. However, it does not shift one comma in the state of political debate in the country. The problem is no longer the war, but the postwar: the fact that in Stolac all the children attend school in the same school building, but Bosniak children have to enter one door whereas Croatian another; the fact that children study from different curricula that teach opposite versions of the recent past of the country; and the fact that institutions at every level are explicitly or implicitly ethnically denominated. There are thirteen parliaments, three presidents, and one high representative for everybody. In other words, this remains a divided country: divided among the lines defined by those who wanted, fought, and won the war. With Karadzic arrested, thirteen years later, the consequences of his vision are still there to be confronted. After having exited from the war, now there is a need to exist from the postwar.